Years ago I found those most beautiful champagne/wine cooler in a magazine. It was love at first sight for me. 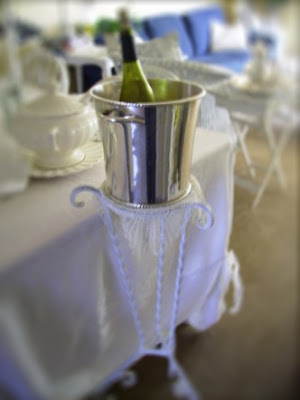 It had a glass bucket and a distressed white stand with crystal bead trim draping around it. I found it for sale online but it was more than I could afford...I think it was around $175. My version doesn't really look anything like that one but it hardly cost a thing and I like it. I found this silver plated champagne bucket at the thrift store for $7.99. It still had the Pottery Barn sticker on the bottom (probably another wedding gift that someone donated after it tarnished.) The plant stand was passed down to me from my parents. I painted it white and put a small plate on top of it, covered the plate up with a crocheted doily and put the bucket on top. What a romantic look...too bad I don't have a nice man that I can cook for! Oh well...it looks good. UPDATED: These are the photos of the one I made. I can see by the comments that I'm confusing everyone. I looked for a picture of the one I fell in love with but I couldn't find it. I'm very honored that some of you thought these were the magazine pictures! I think it's so funny that I'm making do with what I have now. When I was growing up and I would see something I wanted, my mother would always say "we can make that." I hated hearing those words back then! Now I understand. Sometimes you have to make do with what you have! I'm so thankful for my parents for teaching me that I can make things myself. Oh, oooh! What a look. Your place is just so perfectly soothing, lovely and complete. I just love that look. Aw, a man might just want pizza and beer and the baseball game on with the tv turned around so he could see it... I want you to get your chandelier hung, but I think you need another pair or two of hands to steady it while you wire and clamp. If I didn't live in Missouri, I'd send my 6 foot 7 son!!! He wouldn't even need a ladder. I hope your ex comes and helps you or you find somebody soon... Be careful. What beautiful pictures. I just want to pull up a chair and toast you with that champaigne. Here's to Cindy, a beautiful, resourceful woman who has come a long way on this journey called life to find herself in a place of peace where she lives with gratitude for her many blessings and in return is blessed with everything she needs to create a lovely home for her family and friends. May the good Lord continue to bless and keep you. beautiful. I kept waiting to see your wine bucket. I thought I was looking at the magazine pictures. It's lovely. Ooooo, its so lovely. I love your room. Its so peaceful! Oh and P.S, Its way more fun to be creative! Your decorating is amazing. You need to have your home featured in a magazine. What beautiful pictures! I really think "making do" forces you to think creatively, and just look what lovely things result! Wish I could come help hang your chandelier, but I live clear across the country and I'm a coward when it comes to electricity anyway. Maybe you could find a trade school student who would do it cheaply? Your dining room looks beautiful just as is! I thought you WERE showing us the pics from the magazine that you were trying to copy until I reread the text more closely. This is perfect! I bet it's lovelier than the original. I love "making do" because it means more to you when you did it yourself then when you just purchased it. Anyone can spend money, but look how clever you are to get the same effect simply by being creative! Great job! It looks beautiful. I love redoing things that you see. It is so much more fun. Anyone can go buy something already done. I hope you find Mr.Right soon! So lovely Cindy! I love seeing pictures of your home because it reminds me that you can be surrounded by beauty no matter what your budget is! I agree with everyone else, I kept waiting to see a picture of your champagne bucket and that WAS it. Those are some truly beautiful pictures, your home is so pretty. What a great find! It looks beautiful by your table. 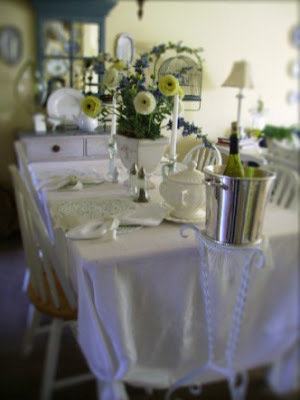 Beautiful table and I LOVE the new layout for your blog. Oh Cindy...since I have been away, you have been playing! I adore your new look. Just so pretty. You are one of my inspirations and for so many wonderful reasons. I adore your blog, I adore you and I adore your home...have a sweet Wednesday. You photos could very well be in a magazine! Love that look and yes, the blurring around the edges of the pictures does look 'dreamy'. Very professional looking! Cindy...Wonderful. You made my day. 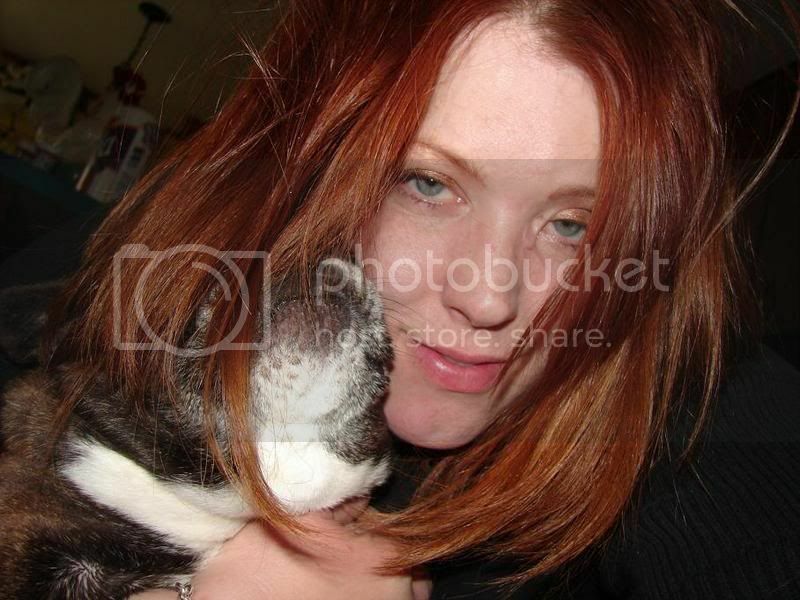 Just got through the weekend of my former anniversary date and caught your blog. True life moves on in all different ways. Thank you for sharing your beautiful ideas and thoughts. Moving forward a single mom is OK. Yes, I can see why some were confused...Your photos are BEAUTIFUL! Blurring the edge gives it a very professional look. As a child, we always had to "make do" while my cousin got the brand new, store bought, expensive version. Now as an adult, I can see that mom taught us a valueable lesson of living simply and within your means. Lovely job on your champaign bucket! Has your home ever been featured in a magazine?? Because it should be! Thank you all so much! Anita: no my home has never been in a magazine. I think they would drive off when they saw the outside of my place. It's a 60's something four-plex and not very pretty from the outside! Maybe some day I'll find a cute little house that I can afford to rent. Rent is so high in this area! Sometimes even if you can afford to buy something that you know is way overpriced..it is more fun to put yourself into a project and feel good about what you spent on it. You are just a pro at doing it Cindy. Thank you so much for taking the time to share your ideas in your blog. Many enjoy it. Oh Cindy! Your home SHOULD be featured in Romantic Homes or another one of those glorious magazines! The pictures look great with your new photoshopping technique. I really need to get photoshop for myself. Cindy - the pictures of your home are always so beautiful. I love your table settings. You do such a great job decorating!